This badge was issued to Vy Tran on 13 May 2017. 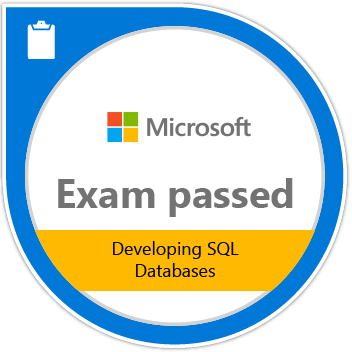 Passing Exam 762: Developing SQL Databases validates the skills and knowledge necessary to build and implement databases across organizations and to ensure high levels of data availability. Candidates demonstrate the ability to create database files, data types, and tables; plan, create, and optimize indexes; ensure data integrity; implement views, stored procedures, and functions; and manage transactions.